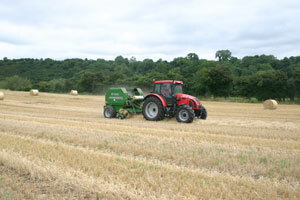 Our excitement today was watching the straw from an entire field being baled in a matter of a few hours by one guy on his own. I had never seen this machinery in operation up close. 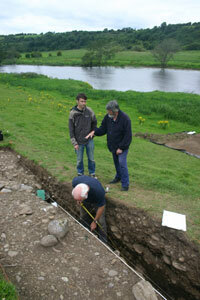 Mind you, he hadn’t ever seen an archaeological excavation up close either. A first for all concerned. Kevin the geophysicist visited the site again today to take one last look at the remaining open trenches to see how well the excavated features match up with those recorded by the specialist geophysical equipment. There will be a very interesting comparison done at a later date and there may even be a few papers in geophysics journals reporting on the results of the test. On site today the atmosphere was a little different to previous days. Everybody, I think, was conscious of the clock ticking and time running out. Most of the work of the day was directed towards recording and sampling, and there was very little actual digging done as most of this had been finished yesterday. 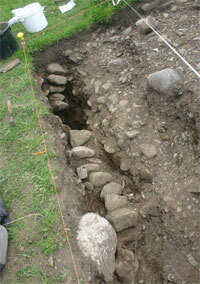 There was still a little bit to do cleaning out Trench 1 and the small feature to the west of the big ditch. We had thought for a while that this was a pit but as more excavation was done, it was clear that it was as predicted in the geophysical survey: an irregular linear ditch-like feature running downslope at a slight angle. We are still in the dark as to when this feature was created as there is no stratigraphic link between it and the other features in Trench 1. There was some flint out of it, but as we found out yesterday, this does not guarantee a Stone Age date – many items can be residual and redeposited in later times. 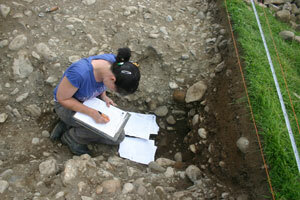 After this, the section drawings had to be completed in Trenches 1 and 3 and a plan had to be drawn in Trench 3. At the same time, we had to check that written descriptions of each of the features and layers (contexts) had been fully completed, and that samples had been taken. Lunch time came and went and despite being reminded of the time, everyone worked until each particular task was completed before walking up the hill to the cabin. Although hungry, everyone was absorbed in the work and was racing to get everything completed. 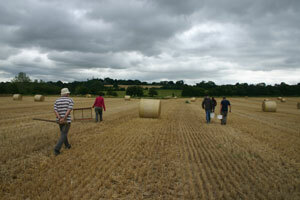 When we did head up, we were able to walk through the barley field which is now stubble. We felt like the journey had been halved by our new route. 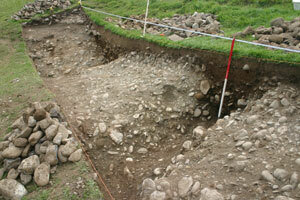 In Trench 1 Matt and Kieran completed their section drawing, Kieran assisted by Eimear. Matt took a closer look at the revetment feature at the east end of the trench and realised that it has some considerable depth. The stones are several courses deep (and continuing) and are set at an 80 degree angle and act as a facing to the steep bank, keeping it in place. Someone went to a lot of trouble to make this structure, and the clues we have suggest that there were many other such structures all over the slope.